Thousands of oil refinery workers are striking for safer working conditions. Their fight is central to the struggle against climate change. NGO-led efforts to combat climate change have resulted in decades of failed negotiations, increased fossil-fuel production, and degraded working conditions. The largest oil workers strike in decades — now in its third week — contains within it the seeds of an alternative: class-struggle environmentalism. About 5,200 workers are currently on strike, though the union says that number could jump this week if the industry continues to balk at the negotiating table. Initially involving about 10 percent of the nation’s refining capacity, it has since expanded to two refineries in Ohio and Indiana and could potentially include all 30,000 workers represented by the United Steelworkers (USW). The strike is primarily a conflict over workplace safety. And to their credit, many environmentalists have come out in support of the oil workers, quick to see the connection between safe working conditions inside refinery fences and safe communities and ecosystems around oil refineries. But for ecosocialists, it’s not just the immediate demands of workers that are important, but the long-term ramifications of a victory. Workers have power if they act collectively. Just as they can stop oil production (30,000 workers have the capacity to halt 64 percent of the nation’s refining capacity), they can halt capitalism’s assault on the planet. To be sure, there’s not a direct line between a strike for better working conditions and a strike for new energy and a more just economy. It is the job of ecosocialists to demonstrate the deep connection between the two, to offer an analysis and strategy of struggle that speaks to workers’ lived experiences. And there’s a long history to draw on here: the early environmental movement had deep links with industrial workers, energy workers in particular. Oil workers are wedged between forces of capital and ecology, technological change and political power. But in the present moment, when nationwide strikes have all but disappeared from the unions’ arsenal, the refinery workers strike represents a critical juncture for the labor movement and the environmental justice movement. As capitalism and ecological destruction are mutually constituted, so too must be workers’ power and ecological justice. Central to the fight for a new energy economy, which exists in embryo in this strike, is the question of who will produce power, and who will wield it. And as Steve Garey, president of USW Local 12-591, explained in a recent interview, the company practice of contracting maintenance work out to less experienced, non-union contractors who lack the training and work protections provided by the USW puts employees, the community, and the environment at risk. That energy and extractive workers would draw these connections makes sense: from cycles of layoffs and subsequent understaffing to oil spills and contaminated drinking water, they are often the very people who — along with their families and indigenous communities — suffer the brunt of social and ecological devastation wrought by the industry. The same work rules and staffing patterns that can help prevent all-too-common explosions can also minimize the risk of leaks that contaminate community drinking water and wreak havoc on the ecosystem. And while these change alone can’t halt accelerating climate change, they can help reduce the incidence of disasters like the 2005 explosion at BP’s Texas City refinery — which killed 15 workers and injured 180 others after safety procedures were bypassed in order to get portions of the facility back online following repairs — or the 2014 oil spill at BP’s Whiting refinery — which dumped as much as 1,600 gallons of oil into Lake Michigan, Chicago residents’ source of drinking water — or the more than 50,000 gallons of oil that gushed into the Yellowstone River earlier this year. In the meantime, management is operating the refineries, likely compromising the safety of surrounding communities and ecosystems. Management doesn’t have the training or staffing levels to smoothly operate the refineries. On Wednesday, as if to underscore the gravity of workers’ safety demands, an explosion so large it was felt five miles away rocked the ExxonMobil Torrance refinery in California. While no workers were killed, the community and environmental impact remain unclear. The Torrance refinery workers are not on strike at the moment, but they’re organized by the USW and could potentially walk out. The USW has struck at a critical moment that accentuates their strike power. As oil prices continue to plummet, refinery operations play an incredibly important role in buffering the energy giants against massive profit losses. With crude prices dropping, energy companies have relied on refining outfits to maintain profits, since the prices of refined petroleum products (i.e., gasoline) tend to decline more slowly than the falling price of crude oil. The Wall Street Journal reports that “for each dollar-per-barrel of improved profit margin for refined products, BP generates $500 million in extra pre-tax operating profit annually.” When oil prices declined last year, that per-barrel margin was $5.70 higher than the last quarter of 2013. This means that while full-spectrum oil operations like Shell and BP are hemorrhaging money on the crude production end of their business, the refining end of their production has become more lucrative than ever. The oil workers striking at the nation’s refineries have the ability to hit capital where it hurts, shutting down the most profitable part of oil production in a moment of crisis for the industry. In a huge step forward for the environmental justice movement in the United States, many key environmentalists have stepped forward to call for solidarity with the oil workers. Bill McKibben, Oil Change International, Communities for Better Environment, and the Sierra Club have all put out statements of support, alongside newer grassroots organizations like Rising Tide Seattle. Oil refinery workers are in the front line of protecting our communities against the environmental hazards of the oil industry. Their skill and experience is critical for preventing devastating explosions, spills, and releases . . . organized labor must recognize its shared interest with those vying for a healthier planet. As we work to protect the earth from climate change, it is particularly important that we advocate for the needs of workers in fossil fuel industries whose well-being must not be sacrificed to the necessity to reduce greenhouse gas emissions. But environmental justice activists shouldn’t simply see workers as a group they must advocate for; instead, they should view workers as a powerful force that can propel a just energy transition. Fighting around safety issues with the support of environmentalists, as the USW is doing, is an important first step in putting workers back at the center of social transformation and environmental justice. As they make these connections between workplace safety, community health, and environmental protection, the USW is part of a long tradition of workers in energy-extractive industries challenging the “jobs versus environment” framework. In the 1960s and 1970s, coal miners imagined a role for their union and their work in the forging of an ecologically sound and socially just future. As the practice of strip mining expanded, disasters like the Buffalo Creek slurry dam failure pushed the workplace hazards of mining onto the broader community and ecosystem. The catastrophe destroyed West Virginia’s Buffalo Creek Hollow, killed 125 people, injured more than 1,100, and left more than 4,000 homeless; the victims were almost entirely miners and their families. Miners recycled the framework they had used to fight for safer working conditions to struggle against mountaintop removal and strip mining. Workplace safety and protection against the devastation of dam failures required strong environmental protections, they argued. First miners looked to strong reclamation policies, but they were soon advocating the complete abolition of strip mining, a process which could never be safe or ecologically sound. Unfortunately, the alliances they built with organizations who were occupying strip mines to protect the Appalachian mountains from industrial destruction were undercut by the employer’s offensive, which had begun in earnest by the late 1970s. As layoffs rose across the region, and the power of the union to challenge the companies weakened, miners often had no choice but to work in the strip mines, even as they opposed the practice more broadly. In the same period, the Oil, Chemical and Atomic Workers Union “pioneered alliances between workers concerned about job safety and health hazards and communities exposed to pollution generated by companies like Shell, Chevron, and Mobil” by pitching the battle between the union and the companies as a struggle against corporations and their anti-democratic decision-making; it was a struggle that environmentalists, who also lacked the ability to intervene in corporate affairs could relate to. So too with oil. Even as it remains at the center of the American economy, we tend to think of oil as a potent energy source completely abstracted from the people who produce it. Even when they die on the job — which they do, at six times the rate of the average US worker. The dollar price of fossil fuels is so low because the cost of workers’ lives, the health and safety of communities, and the viability of our ecosystems is so low. The oil workers’ strike puts us on the path to raising those costs, and making the energy industry foot the bill. We should thus organize to support the oil strike — getting up strike fund donations, supporting picket lines, inviting workers to speak at community meetings and on college campuses — not only because it will help workers win the strike, but because it can help quicken the transformation of the environmental movement. As significant as winning better working conditions would be — for the workers themselves, as well as for the communities around the refineries — it’s also important to consider what the long-term effects of this strike could be in terms of increasing militancy and organization. Strong unions can fight for jobs and the planet, but we still have a long way to go. To defeat the oil industry ecologically, we need to defeat it ideologically, politically, socially, economically: this strike is a step in that direction, and that’s why it’s so important that to win. Go out to a picket line and begin talking about getting rid of the oil industry, and you’re likely to get some odd stares. 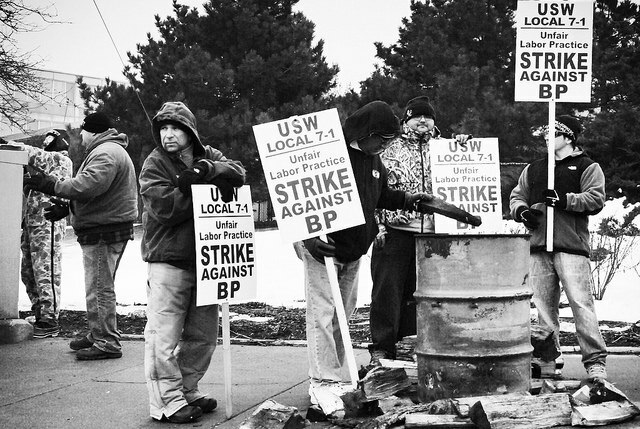 But what’s clear from the hours I’ve spent walking picket lines with workers at the BP refinery in Whiting, Indiana is that the USW workers see themselves as the defenders of their communities and the environment. This is only a starting point, but the time to have debates about our future — beyond fossil fuels, beyond capitalism — is now. And the place to have them is on the USW picket lines. The shift toward environmental justice, a framework that incorporates questions of environmental racism and colonialism and the gendered and sexualized aspects of ecological devastation, represented an enormous step forward for the movement. Now, environmental justice activists must also see workers — and energy workers in particular — as at the heart of the struggle against climate change. There is no more powerful way to learn this lesson than to stand on a picket line with workers fighting for safety (in all its forms). It has a way of teaching you who the real enemy is.